Aims. Evaluation of the efficiency and reproductibility of hybrid transvaginal endoscopic surgery in non-elective surgical procedures to treat intraabdominal infections caused by acute cholecystitis, appendicitis or tubo-ovarian infection. Methods. Prospective non-randomized clinical series of ten selected female patients with acute intraabdominal infection caused by acute cholecystitis (n=6), appendicitis (n=2) and pelvic infection of tubes or ovaries (n=2). Pneumoperitoneum was created by a 5-mm umbilical trocar and transvaginal approach was realized with a 15-mm trocar to entry the double-channel endoscope in the abdominal cavity. For appendectomy no more trocars were employed while for cholecystectomy, a 3-mm trocar was inserted in the right upper quadrant of the abdomen to tract the gallbladder. In four cases of pelvic infection (two appendicitis and two tubo-ovarian infections), transvaginal endoscopic appendectomy was performed. 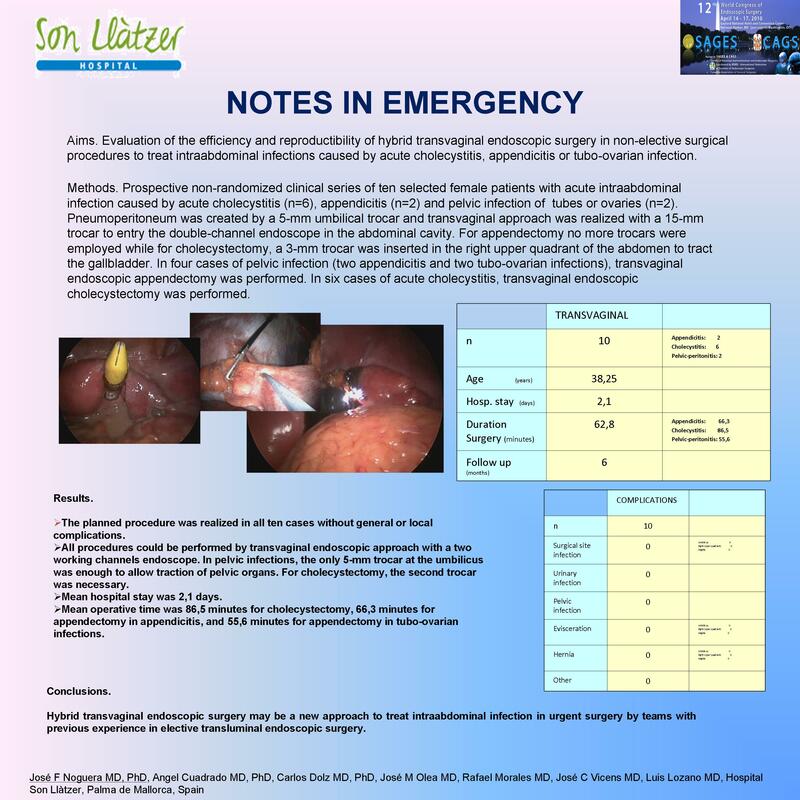 In six cases of acute cholecystitis, transvaginal endoscopic cholecystectomy was performed. Results. The planned procedure was realized in all ten cases without general or local complications. All procedures could be performed by transvaginal endoscopic approach with a two working channels endoscope. In pelvic infections, the only 5-mm trocar at the umbilicus was enough to allow traction of pelvic organs. For cholecystectomy, the second trocar was necessary. Mean hospital stay was 2,1 days. Mean operative time was 86,5 minutes for cholecystectomy, 66,3 minutes for appendectomy in appendicitis, and 35,6 minutes for appendectomy in tubo-ovarian infections. Conclusions. Hybrid transvaginal endoscopic surgery may be a new approach to treat intraabdominal infection in urgent surgery by teams with previous experience in elective transluminal endoscopic surgery.